Happy Halloween!! I hope you had a great weekend and that you have a lot of fun plans for the day. I will be spending the first part of my day at preschool watching the kiddos march around in their costumes, and eating a Halloween lunch with the birthday girl. 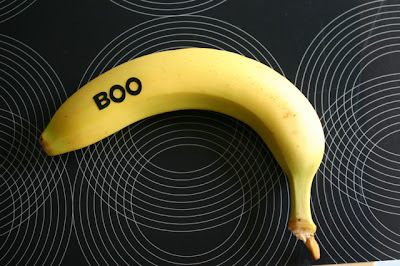 I wish I would have seen this cute Halloween banana idea from Family Chic before I packed her lunch today. 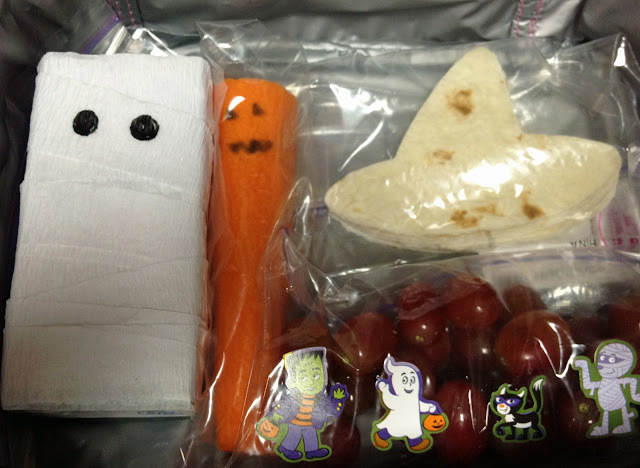 I couldn't figure out what to do with her fruit, so I just used Halloween stickers on the a bag of grapes. I should have put the stickers on a banana. Did anyone get a fun Halloween lunch in your house today? Oh my adorable! my kids would have loved this! Maybe I can try something similar for dinner?